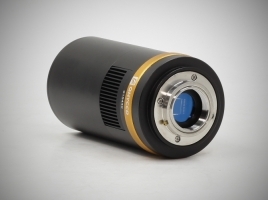 The QHY10 is an APS-C size cooled single shot CCD camera using SONY's ICX493AQA sensor. It has 10 Megapixels with a pixel size of 6.05 x 6.05um. 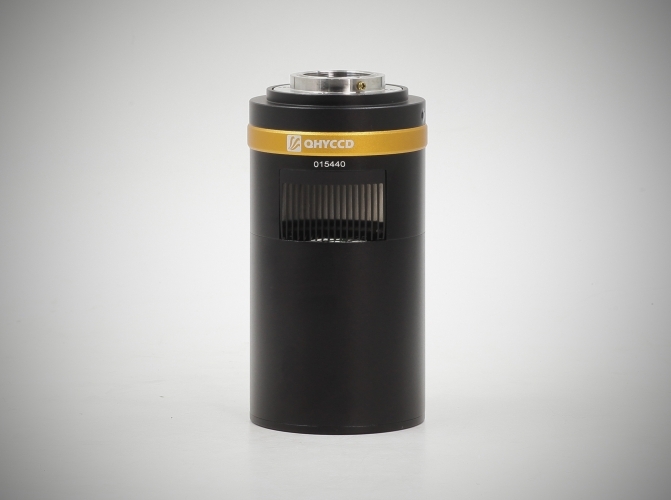 The QHY10 has two-stage thermoelectric cooling that reduces the temperature of the CCD to -40C below ambient. The combination of QHYCCD cooling technology and SONY SuperHAD low dark current technology results in an exceptionally clean, low noise image, even in a very long exposure. In addition to the very low thermal noise of Sony's SuperHAD technology, this sensor has a high full well capacity. Even with high resolution 6.05um square pixels, it has a 45ke- full well. This is almost double that of the ICX413 with 7.8um square pixels, and almost double that of the KAF-8300 color sensor with 5.4um square pixels. The high full well capacity yields a higher dynamic range allowing a longer exposure time without signal saturation. This yields better colors and smaller star points. The QHY10 comes with a clip for USB and power cables to help keep solid connections and avoid conditions that result in loss of contact. Compared to other cameras using the KAF-8300C, the QHY10 has a larger sensor, larger pixel size, more pixels, greater full well capacity (dynamic range), lower thermal noise, lower read noise, and smaller body size. It has an electronic shutter and 2-stage TE cooling. If you are considering an 8300 color camera, don't hesitate get an affordably priced QHY10 right now.